The Insert Fields tab is part of the customization panel which is available for your convenience. It is located in the right sidebar when you are in your form Settings or a View. 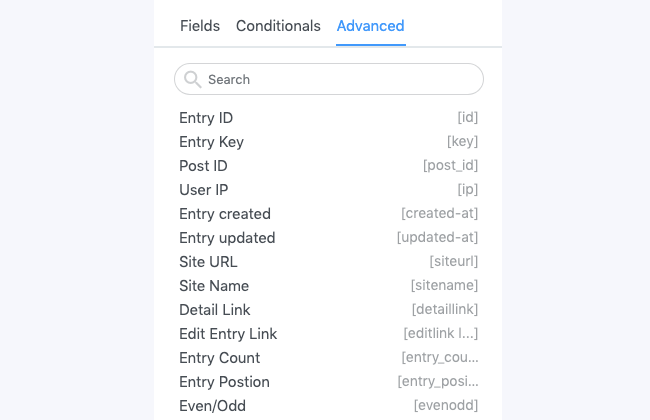 The Insert Fields tab is used to insert field IDs/keys and other helpful shortcodes. Please note that some of these features are not included in the lite version. This section displays a clickable list of field IDs and Keys from the associated form. The ID and Key work synonymously, although it may be better to use the field key over the field ID at times. The original field IDs on a site will not change, but the field keys can be edited. If you plan to export your forms or Views to other sites, using field keys is best because these are preserved on export/import. Also, if you're using WPMU and copying your View settings to other blogs, you should use the field keys since they will be consistent across the subsites. When a field ID or key is added to a View, email notification, form success message, etc., it will display the value saved in that field. This [x show=y] shortcodes allow you to pull values from other fields in the form that the Dynamic Field is getting its data from. Visit the Display values from linked entry article for more information. This section contains several helpful shortcodes. Different shortcodes will be available depending on whether you are in a View, your form's Settings, or an Email notification. The following helpers are available everywhere in your form's Settings and Views. Inserts the id of the entry. Inserts the key of the entry. Inserts the ID of the created post. This is applicable only if your form is set up to create posts. Inserts the IP address of the user who submitted the form. Inserts the date and time the entry was originally submitted. Inserts the date and time of the most recent update of the entry. This is only applicable if your form allows users to edit. Show the Display Name of the user who updated an entry most recently. Inserts the WordPress URL of your site from the WordPress Settings -> General page. Inserts the name of your site. The following helpers are only available in a View. Displays the URL for the Detail Page of a View. This option will only exist if you selected Both/Dynamic or Calendar as your View Format. Use the following HTML in your View to insert a clickable link that takes users to the Detail Page. If a form is set up to create posts, the detaillink will redirect to the single post page. Inserts an edit link which takes the user to edit an entry. You must first allow users to edit in order for the link to appear. Learn more about the editlink parameters here. Note: you must replace x with the ID of the page where your form is published. If you would like to apply different styling to every other listing, insert this tag as a class on the div tag surrounding the content. The odd listings will call the 'odd' class, and the even listings will call the 'even' class. Displays the number of entries in a View. Put this shortcode in the Before or After Content of your View. When working with repeating events, it may be helpful to use the [event_date] shortcode. So, if the original event starts on June 1st and repeats once a week, the shortcode will show June 8th, June 15th, etc. This shortcode can also be used with multi-day events, allowing the appropriate dates to show in the calendar. The shortcode can format the date as follows. Displays 1 if the entry is a draft and 0 otherwise. The following helpers are only available in an email notification. This option is only visible from your form's Email settings tab. Inserts the shortcode for the default email message. This option is only visible from your form's Email settings tab. Inserts the complete HTML for the default email message. This allows you to easily modify and customize the default email message. This option is only visible from your form's Email settings tab. Inserts the complete plain text for the default email message.